The American Band at its sweat-dripping best, the legendary rock band Grand Funk emits a surging, elemental blast of hard rock heat. Now rock fans everywhere will be thrilled to learn they can once again warm themselves in front of the fire. The top selling American rock group of the 70s is back. Grand Funk is newly reformed, stoked by the reissue of the group's catalog on CD and the new box set Thirty Years of Funk, The Anthology by EMI-Capitol records. The group is also featured regularly on VH-1's Behind the Music. After playing to more than a million fans on the band's '96, '97, and '98 tours, Grand Funk has just announced plans for a 2000-2002 tour that began December 2, 2000 in West Palm Beach, Florida. Generally acknowledged as one of the precursors to heavy metal, Grand Funk laid the groundwork for such bands as Foreigner, Journey, Van Halen and Bon Jovi with its signature hard driving sound; a combination of soulful vocals, muscular instrumentation and forceful pop melodies. The fact that Grand Funk's legacy still looms large over the pop music landscape more than thirty years after its birth in Flint, Michigan is also a testament to the group's influence and staying power. Mega-hits "We're An American Band," "I'm Your Captain/Closer To Home," "Locomotion," and "Some Kind Of Wonderful" still receive continuous airplay on Classic Rock radio. Legend has it that Prince named his first rock band Grand Central as a nod to Grand Funk. Internationally acclaimed, Grand Funk has toured the world, selling out in the U.S., Canada, Europe, Japan and South America. A 1971 performance at New York's Shea Stadium sold out faster than the Beatles. The group's widespread appeal is also evident in its considerable recording achievements. Over their career, Grand Funk has had 19 charted singles, eight Top 40 hits and two Number One singles ("We're An American Band" and "Locomotion," both selling more than one million each). The group has 12 gold and 10 platinum records with record sales in excess of 25 million copies sold worldwide. Formed in 1969, Grand Funk was born out of the ashes of Terry Knight & The Pack, another band from Flint, Michigan. Currently the group includes original founding members Don Brewer (vocals and drums, writer and singer of the hit, "We're An American Band") and bassist Mel Schacher. Joining Don and Mel is an all-star cast featuring singer Max Carl (38 Special, Jack Mack and the Heart Attack, Max Carl and Big Dance), lead guitarist Bruce Kulick (12 years with Kiss and credits with Michael Bolton, Meatloaf and Billy Squire - and SIT-strings endorsee) and keyboardist Tim Cashion (Bob Seger and Robert Palmer). Together, Brewer and Schacher have created a dynamic and multi-talented five piece band that will not only carry on the tradition of Grand Funk hits, but also has the potential to create a new chapter in the legacy of Grand Funk Railroad. 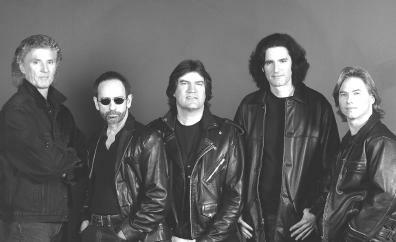 With Grand Funk reforming in 2000, this new chapter in the band's biography is being written daily. With the announcement of the group's plans to tour the U.S. in 2001 and 2002, both seasoned Grand Funk lovers and contemporary rock fans discovering the group for the first time on CD?s and VH-1 will be able to see and hear first hand that Grand Funk Railroad train is back on track.